GEARWRENCH Diamond-Tip Screwdrivers are designed with a tri-lobe, dual-material ergonomic handle which is oil and solvent resistant. It also has a Speed Zone for fast turning in low-torque applications. The diamond coated tips provide four times more gripping power, reduced cam-out and slippage. SPARKS, Md., Oct. 29, 2018 /PRNewswire/ -- When improving on a classic tool, it's the littlest details that make the biggest difference. The new GEARWRENCH® Diamond-Tip Screwdriver Set gets to the nitty gritty of this iconic tool to make it better and more durable for those that use screwdrivers every day. 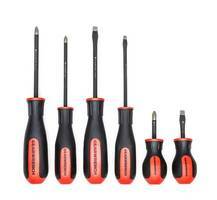 A part of the Apex Tool Group, GEARWRENCH is a brand of professional hand tools and accessories. The GEARWRENCH Diamond Tip Screwdrivers are engineered with tri-lobe ergonomic handles for optimal strength and comfort, and a Speed Zone for fast turning in low-torque applications. The dual-material handle is oil and solvent resistant, providing better comfort and performance. Manganese phosphate coated blades provide superior corrosion resistance, and the diamond-coated tips provide up to four times the gripping power while reducing cam-out and slippage compared to non-diamond-coated tips. "You might think there's not much you can do to a screwdriver to make it better, but that's what we've done with this new set," said product manager Jim Stewart. "As we do with everything we make, we listened to people who use the tools the most and applied their needs and wants to develop a superior product." The set of six includes three Phillips-head screwdrivers (#1 x 4", #2 x 1½", #2 x 4") and three slotted screwdrivers (3/16" x 4", ¼" x 1 ½", ¼" x 4").